Cbet nr. 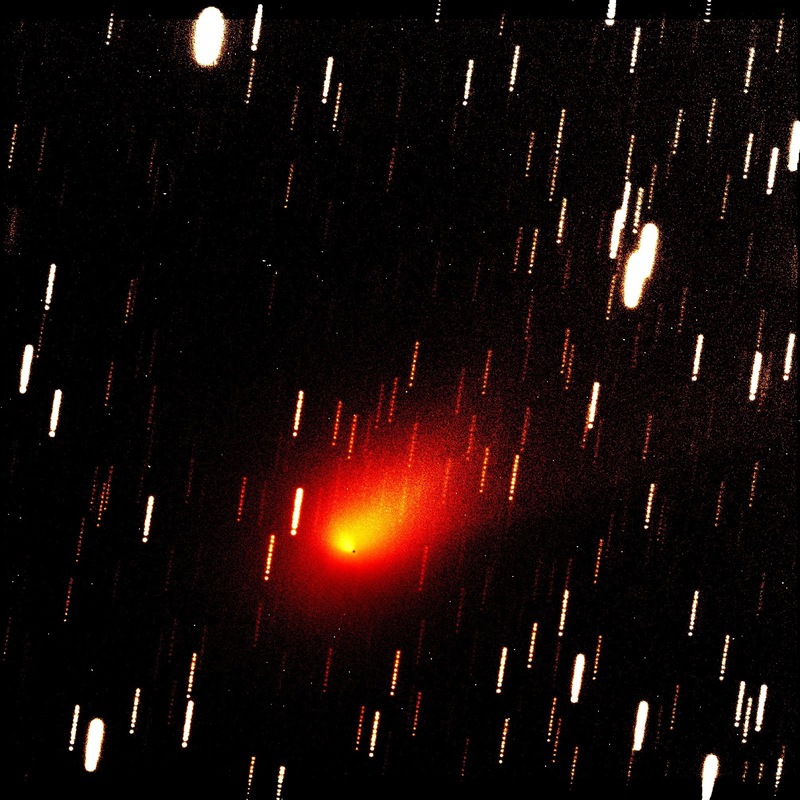 3390, issued on 2013, January 23, announces the discovery of a new comet (discovery magnitude 18.9) on images taken by J. A. Johnson with the Catalina Sky Survey's 0.68-m Schmidt telescope + CCD on January 16.2. 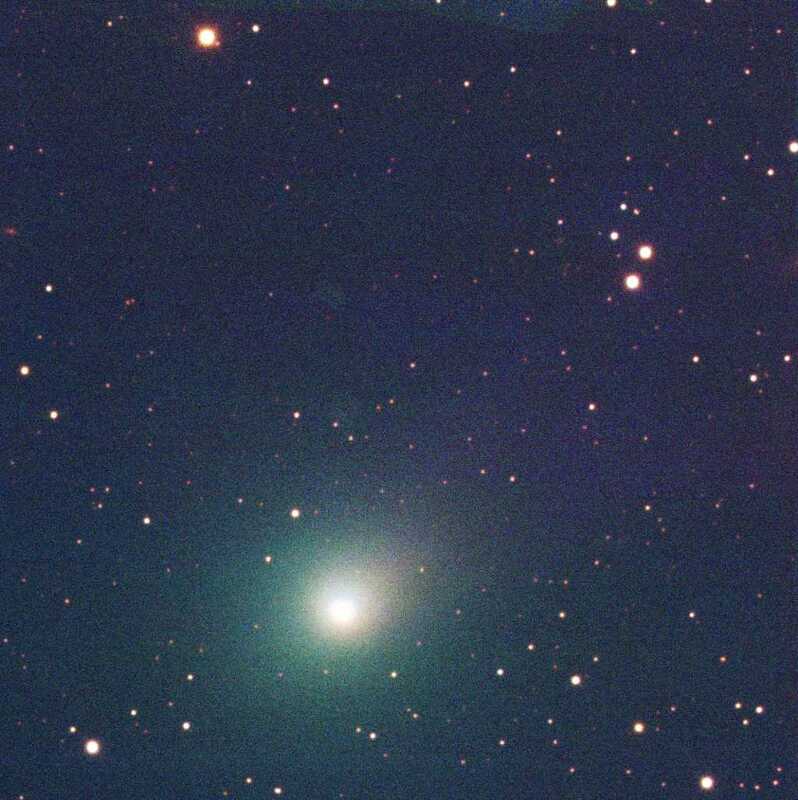 The new comet has been designated C/2013 B2 (CATALINA). The apparently asteroidal object posted on the Minor Planet Center's NEOCP webpage, has been found to show cometary appearance by CCD astrometrists elsewhere. We performed follow-up measurements of this object, while it was still on the neocp. Stacking of 22 R-filtered exposures, 50-sec each, obtained remotely, from the Haleakala-Faulkes Telescope North on 2013, Jan. 23.5, through a 2.0-m f/10.0 Ritchey-Chretien + CCD, shows that this object appears slightly diffuse compared to the nearby field stars of similar brightness and elongated toward PA 220. M.P.E.C. 2013-B84 assigns the following preliminary parabolic orbital elements to comet C/2013 B2: T 2013 June 30.59; e= 1.0; Peri. = 156.14; q = 3.75; Incl.= 43.56. Cbet nr. 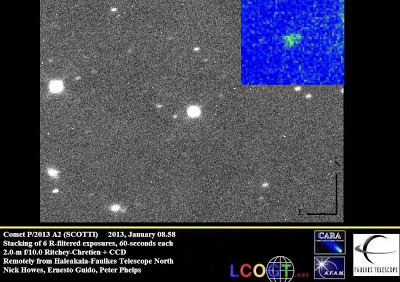 3376, issued on 2013, January 08, announces the discovery of a new comet (discovery magnitude 19.5) by J. Scotti with the 691 Steward Observatory, Kitt Peak, on images obtained with the 0.9-m f/3 reflector + CCD on January 06.2. The new comet has been designated P/2013 A2 (SCOTTI). We performed some follow-up measurements of this object, while it was still on the neocp. 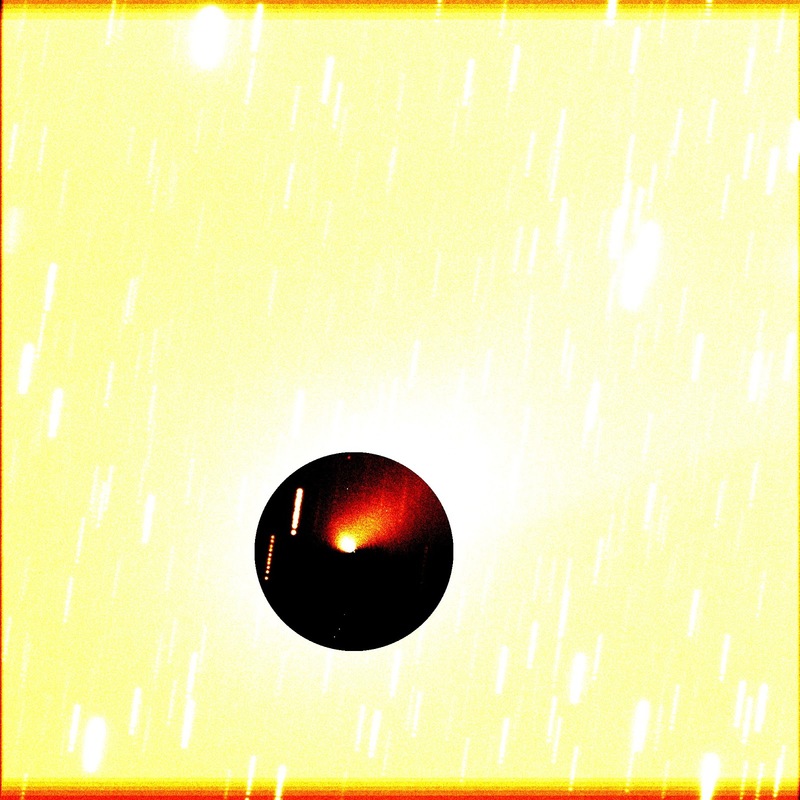 Stacking of 6 R-filtered exposures, 60-sec each, obtained remotely, from the Haleakala-Faulkes Telescope North on 2013, Jan. 08.6, through a 2.0-m f/10.0 Ritchey-Chretien + CCD, shows that this object appears "soft" compared to the nearby field stars of similar brightness and elongated toward PA 290. Our observations combined with those of Peter Phelps of Hazelmere School in the UK, using Faulkes South later in the day helped confirm the nature of the object. M.P.E.C. 2013-A45 assigns the following preliminary elliptical orbital elements to comet P/2013 A2: T 2013 May 16.14; e= 0.57; Peri. 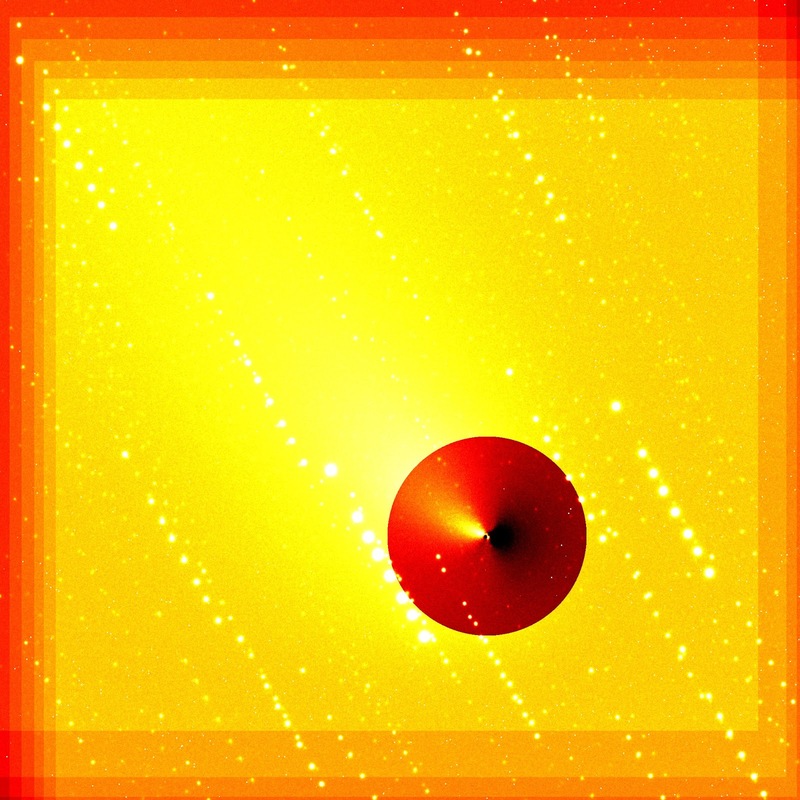 = 182.74; q = 1.98 AU; Incl.= 3.89. 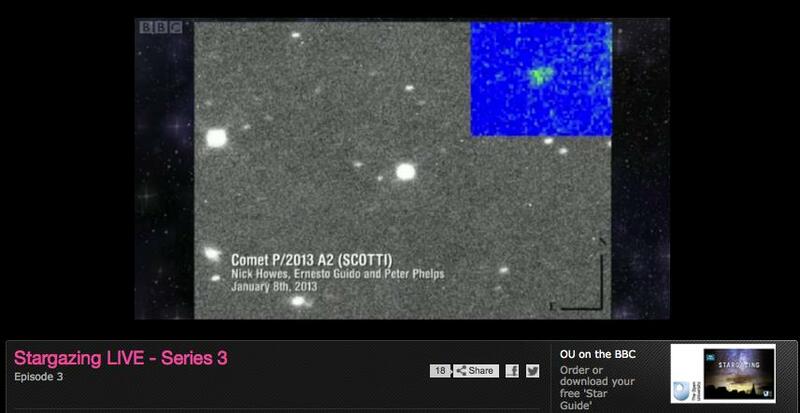 Our confirmation image of comet P/2013 A2 (SCOTTI) was featured on BBC StarGazing Live on January 10, 2013. Cbet nr. 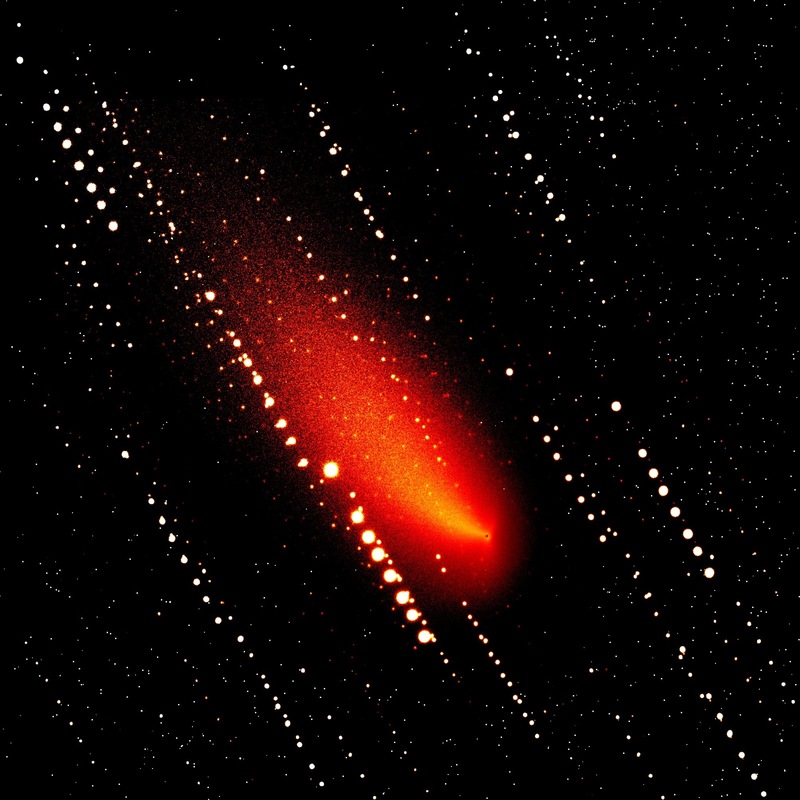 3367, issued on 2013, January 01, announces the discovery of a new comet (discovery magnitude 15.2) by the E12 Siding Spring Survey on images obtained with the 0.5-m Uppsala Schmidt + CCD on December 30.6. The new comet has been designated C/2012 Y3 (MCNAUGHT). We performed some follow-up measurements of this object, while it was still on the neocp. Stacking of 19 unfiltered exposures, 30-sec each,obtained remotely,from Q62 (iTelescope Observatory, Siding Spring) on 2013, Jan. 01.46, through a 0.32-m f/9.0 Ritchey-Chretien + CCD shows that this object is a comet: coma about 10" in diameter with a fan-shaped tail elongated in PA 85. M.P.E.C. 2013-A03 assigns the following preliminary parabolic orbital elements to comet C/2012 Y3: T 2012 Aug. 26.59; e= 1.0; Peri. = 236.15; q = 1.78 AU; Incl.= 73.90.